The Brackley and District History Society holds regular monthly meetings with a talk on a history topic associated with the local area wherever possible. The Society aims to encourage the preservation of historical knowledge and objects of local interest. Meetings are held on 1st Wednesday of every month at the Methodist Church Hall, High Street, Brackley at 7.30pm. Brackley can trace its history back to the Iron Age. Recent excavations to the north of the town would seem to indicate quite a substantial Iron Age settlement and remains from that period have also been found at the Mill Lane development and the old Castle Lane site. In Roman times, there were at least two Roman villas built where the present Roman estate now stands off Buckingham Road, but it was not until after the Saxon invasions that Brackley got its name. It is believed that sometime between 550 and 650 AD, a man called Bracca, who came from the Saxon settlement at Halse came into possession of a small 'ley' or clearing around where St. Peters Church now stands. 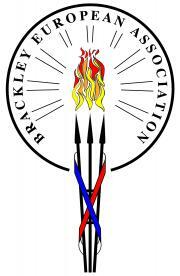 He built a small village there which he named after himself; Braccaley, which became Brackley. Thus it was, that by the time the Normans arrived sometime after 1066 Brackley was in the Hundred of Odboldistow and the Manor of Halse. Indeed Brackley's Manor House remained in Halse for another two centuries, although as time passed, Brackley far outgrew Halse. When the Normans arrived they established themselves some distance from the original Saxon village, around the castle they built by the forde over the River Ouse to protect the new road they were building between Oxford and Northampton. Only slight evidence of the castle now survives along Hinton Road. The Norman settlement expanded up the hill along the new road and became a town of much importance. To prevent the barons using tournaments as local wars, Richard I named only five official places where tourneys could be held; Brackley became one of the five. Trade along the new road brought prosperity to Brackley and by 13th century it was a staple town which sent delegates to trade meetings at Westminster. 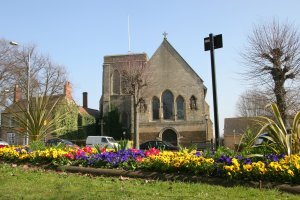 The parish church was mostly built in 13th and 14th centuries and, on the eastern side of the High Street, the Hospital of St. James and St. John was founded in 1150. This later passed to Magdalen College of Oxford, who, at the Dissolution, founded a grammar school which existed until 1972. The original hospital chapel survives, and was restored in 1870. Brackley fell on hard times during the Tudor period, however still retained the right to elect a Mayor, and by 1547 it was allowed to send two members to Parliament. The Civil War saw Brackley on the side of the Roundheads. A record exists of Royalist troops going from Northampton to Oxford and being attacked and routed by the citizens of Brackley, despite their only having the most rudimentary of weapons. The spoils of the battle were worth six or seven thousand pounds and many local people who did not have a horse before rather suddenly obtained one. Because of its central position, Brackley was often a stopping place during the Civil War. Brackley prospered again as the coaching era dawned and it became a staging post. Several coaching inns from the period survive today albeit in a modernised form: The Crown Hotel on Market Place and The Plough public house. The town was dominated by the Egerton family for some two centuries until the Reform Act of 1832, when Brackley lost its two MP's and never regained its former importance, becoming a rather quiet market town. In the mid 19th Century the railways came to Brackley, with its first station on the L.N.W.R route from Banbury to Bletchley. Fifty years later, the Great Central Railway opened its extension from Leicester South to London Marylebone station, and on this line a station was built at the north of Brackley. This was the last of the main lines to reach the capital. Both lines, and stations however were closed under the Beeching cuts in the 1960's and Brackley lost all rail links. In more recent times, especially since the early 1950's, Brackley has grown significantly and new industry has been attracted to the town whose activities now include food processing, engineering, motorsport and many other manufacturing industries. In 1974 Brackley lost its Borough status and became a Parish, with its own Town Council within the South Northamptonshire District. In 2012 the population was approximately 15,000. The next few years will see this number rise as housing developments increase. In addition a new school, community centre, health care facility, shops and a central park will be built to the north of the town.